As we all know, "growing up is hard to do". As a Nation, we’re still relatively young in age, and as is the case with most young, growing minds, we generally take the "trial and error" approach to problem solving (and therefore to obtaining knowledge). Of course, the ultimate success of this method is predicated on an ability to detect error, and unfortunately, as individuals and as a Country, we are often blind or oblivious to such "errors", and hence engage in trials which are needlessly lengthy, not to mention costly (on a number of levels). Such extended trials can be seen as "doing the same thing over and over and expecting different results", which of course was Einstein’s definition of "insanity". Well my friends, as individuals, and as a Country, it is time to open our eyes, recognize the error, discontinue this trial, and stop the insanity. It is time to legalize Marijuana. This Wednesday, Chicago Alderman Danny Solis will introduce an ordinance that decriminalizes marijuana possession, (10 grams or less), with "offenders" now receiving $200 tickets, as well as a life long record. A slight departure from the standard erroneous trial-yes, a local step towards sanity, which many other cities and states have already made- great; but facts, common sense, reality, they all demand more than baby steps, they demand a collective leap, they demand outright legalization. 743 out of every 100,000 Americans are in prison. That comes out to roughly 2.3 million people behind bars. For the patriotic optimists out there, both those numbers are good/bad enough for tops in the world, so in other words, no country is as good as us, at locking up their own citizens-yay America! (BTW China has 4x the population, yet only 1.6 million prisoners). It is important to note that the overwhelming majority of those arrested and jailed for drug offenses, are minorities (in Chicago, 78% of those arrested, and 90% of those convicted, are minorities).This of course is despite the fact that Caucasians are just as likely to use illegal drugs as minorities. So what does locking up non-violent pot offenders cost taxpayers annually? Around $1 Billion. A lot of money yes, but an amount that is dwarfed by the $8 billion spent annually in simply enoforcing Marijuana laws. (Law Enforcement costs , 800,000 arrests, court costs, etc). Well the expensive means must at least result in the desired end….deterrence/less marijuana use…right? A 2010 study by the Substance Abuse and Mental Health Services Administration, found that marijuana use among Americans aged 12 and older, rose from 5.8 percent in 2007 to 6.9 percent in 2010. That equates to 17.4 million American teens and adults....who were honest on the survey. That’s 17.4 million (plus 5-10 million liars) "black market consumers", consumers who spend billions of dollars annually on marijuana. Well I gotta say, that seems like a thriving, highly profitable industry to me; I wonder if I know anyone who could benefit from such a thing. Oh yea, the United States of America. It is estimated that if Marijuana was legalized and taxed much the way alcohol and tobacco are, it could generate anywhere from $40-$100 Billion in revenue annually. (If the cost of retailing and distribution is the same as for legal tobacco cigarettes-about 10¢ a gram, and is sold around the same price as on the street today-$10 per gram). Man, that would look good in the "public purse" huh? It could go towards such "luxuries" as modern schools and infrastructure, as well as more cops, firefighters and teachers… and all without raising taxes on billionaires/upsetting Grover Norquist! But enough of the complicated facts, let’s talk common sense. 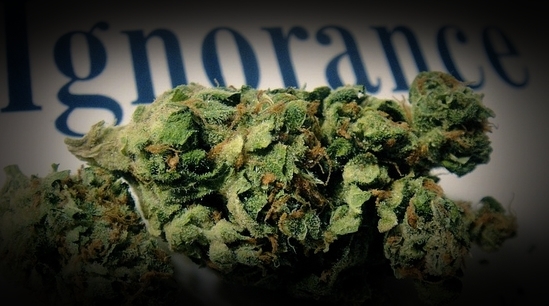 Why is alcohol legal…or Vicodin and OxyContin for that matter, and yet marijuana is not? Because Marijuana is more dangerous-both for the individual and society? Well it is more addictive. Well...it's a "Gateway Drug", and moreover, its legalization would begin a slippery slope to complete social destruction (Legal Marijuana one day, kids legally doing lines of coke off the stomachs of terrorists in Grant Park the next). Because the outdated opinions on marijuana are fueled by myths more than facts, stigmas more than stats, fundamentalism more than science? Because Marijuana doesn’t have hordes of lobbyists paying off Politicians? I however, and millions more like me, will continue to fight, not with big checks, but with indisputable facts, not necessarily appealing to individual connections, but to collective common sense. Oh, and for the record, I don’t smoke marijuana. I also am not gay, or a woman, or unemployed. I am simply an advocate for progress, a fan of laws and policies being based on facts as opposed to fear; a backer of knowledge and common-sense, in their never ending fight against well financed ignorance. Ultimately, I’m just a fan of what is right. Sometimes, what is right is inherently clear. Other times, we figure it out through trial and error. Well, this erroneous trial has gone on long enough. "Why is alcohol legal…" According to some guy who wrote a book about Prohibition, it wasn't about Capone but it was the depression and they needed the tax money, which the old ladies in Evanston were not providing. Look at Preckwinkle, she wants to add to the already exorbitant taxes levied by various levels of Illinois government, including Cook County, on alcohol and cigarettes. What happens if people quit? I guess that so long as people are like Bill Clinton and don't inhale (and he sure sounds like he did inhale), there is nothing wrong with legalizing and taxing it. As far as lobbyists, supposedly the cigarette companies were ready to pounce, but I guess 10 years after the tobacco settlement, their lobbyists are on the scheit list. The essential problem is that you would have to get the feds to go along, since, in California, they say they will enforce the marijuana laws, even if the state says it is all medicinal. Thank you so much, very much appreciated my friend. One comment?! You all should be ashamed! Speak out for legalization:) It's the reasonable, smart, humane thing to do. "It's the reasonable, smart, humane thing to do"
Thanks for checking out the article/your comment. Very much appreciated. Remember that guy who taught our Summer Journalism class? (and some other one Freshman year as well). He would ask Randi questions and she would be clueless. Anyway, thanks a lot Mark, your supportive comments, as always, mean a lot. Bravo. Between this and NORML's knowledge-dropping critique of the White House's marijuana petition response, there has been some kickass commentary on this subject floating around. I'm at the point where I don't even view it as controversial. The facts are right under our noses. It's relatively safe, would save tax money, CREATE tax money, create an entire industry and jobs that would be perfect for 20-somethings currently drowning in student loan debt. Studies also suggest it would LOWER a kid's ability to get their hands on it and reduce crime. What in god's name am I missing? John thanks a lot friend, for your kind words and for your insightful contributions to the argument. Here's my issue. I have an 8-year-old child. It's hard enough to teach kids not to smoke tobacco or stop after one beer or one glass of wine. At least with marijuana, there's the concept that getting caught with it leads to being handcuffed, booked at the police station, appearing before a judge in criminal court, and possibly doing some time in a county jail. It's far worse than getting pulled over for doing 45 in a 35 zone. Am I a bit puritanical? Yes. My grandmother belonged to the WCTU. I used to live in a suburb that was dry, and I always voted no on referenda about going wet. And I'm not a fan of casion gambling in Illinois. Thanks Fred, for checking out the article, and moreover for your personal take on this matter, it brings a different , and important element to the debate. There is no need to label yourself "puritancial", particularly with respect to the ideals you hold for your child. Why would you want him to smoke, drink, etc.? You're being a good father-nothing wrong with that my friend. I would say however, that while intuitvely, legally punishing an act/behavior (operant conditioning) would deter that "undesirable" behavior, most evidence seems to indicate that is simply not true. If anything, the illegal nature of the act makes it more attractive. I know law enforcement wants to keep the laws because it means big bucks in their pockets. I wonder, however, how much the drug cartels funnel into politicians pockets so they, too, can keep the money flowing. Just a thought. If marijuana is ever legalized I hope it is NOT legal to smoke it in public. I have no problem with people doing it in their homes, or the tax revenue and other benefits to society. But I don't like the way it affects me! It makes me depressed. It also makes many people paranoid. I'm sure they don't want it around either. I'm allergic to cigarettes, so I always notice them. Even though Illinois is "smoke-free", you can't walk around in this city without getting some cigarette smoke in your face. I will cross the street to avoid it, if possible, because it makes me sick. If people were smoking weed on the street the way they do cigarettes, I would have to move to a place where it's illegal. I don't want to move! :-( I love Chicago and have a great job here. I'm really tired of smokers (both cigarettes and weed) assuming their smoke isn't hurting anyone. It is and does, even outside. During the buildup to the smoke-free law I saw stories of people with much worse cigarette allergies than mine, who get severe headaches or asthma attacks from a tiny bit of smoke. The difference between liquor/pills/injections and smoked drugs is that the smoke poisons not only the user but everyone around him or her as well. That's a BIG difference! I don't get sick from standing next to a heavy drinker. I do get sick from standing next to a smoker. Even people who get high from it probably don't want to from breathing the fumes of others on their way to work. Would you? If people were allowed to smoke weed on the street we'd have a bunch of depressed people shooting each other (the paranoia and depression effects). Hmm... Is that what was happening on the South Side this summer? Julia-thanks for your interesting comment. I can understand your aversion to smoke being blown in your face, as well as your desire to not be paranoid/depressed. Of course my argument regarding the legalization of marijuana, assumes that the Government (fed/state/local) would have some common sense laws/regulations RE it's usage/distribution (e.g. No public usage/intoxication).